45 Km Route, 2 hours riding at 13.5mph. Leaves at 10am. Please be prepared for adverse weather. Have spare tubes, a pump and a mobile phone in case of emergency. All rides cost £2.00. The next club social night on Monday 4th December (7.30pm) at Greshams is your first opportunity to renew your club membership for 2018, subs remain the same once again for the coming year. Please do come along if you can, it’s much easier for me to renew in person! This is advance notice of the holding of Ipswich Bicycle Club Annual General Meeting. As usual the social evening will feature the opportunity to drink, eat and socialise with fellow members and buy club kit. At 8pm we will have a presentation by a guest speaker, lloyd Chapman a successful local road and TT racer on training for cycling events. The Hill Climbing season is upon us again, so, as last year, we are heading back to Semer and Watson’s Hill for the 2017 event, followed by the Half Wheel competition just round the corner. On Saturday October 7th the SSR (Saturday Social Rides) will head over to Semer, so that those who want to have a go can and others can offer support. Anyone arriving early can get a coffee from Hollow Trees nearby. Registering will be done on the day at the bottom of the hill between 9:45 and 10am when the first rider will start. As for the Half Wheel this is always a fun chance of a trophy and everyone is in with a chance. Please note the Sudbury Open is the following weekend (Sunday 15th) so it’s a great chance to test those legs. Our Club social is next Monday, 3 April, as notified before. Local Ipswich man, Gary Taylor, is coming to talk about his adventures. Follow him on Twitter @GearsWeNeverUse or on Strava, too. 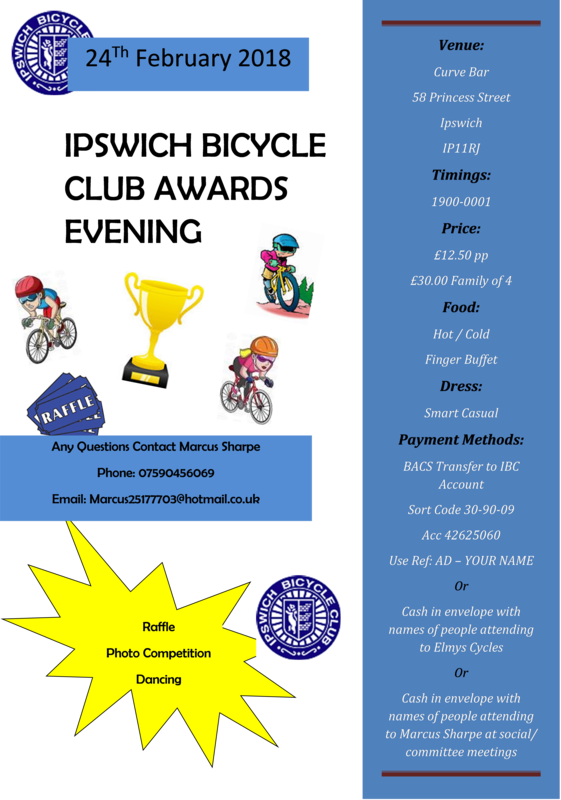 There will be a raffle to raise money for his charity, with a chance to win a bike! All the usual features of a Club Social event at Greshams on Tuddenham road. Be there for 7pm to get your drinks and find the best seats as he will start prompt at 7:30pm.